We’re going to have a very naked discussion about the importance of defensive ammunition for your everyday concealed carry handgun. It’s a discussion that needs to be had and applied if you do not already carry hollow points or defensive rounds. Ball ammo or full metal jacketed ammunition is designed to push through a soft target. For rounds traveling at lower velocities, such as .380 ACP and .45 ACP, there’s a chance the bullet can get lodged in soft tissue if it ricochets off bone or cartilage. For lighter rifle rounds like the 5.56 or 5.45mm rounds fired from AR-15s and AK-74 variants, these rounds tumble when they hit soft tissue but penetrate when they hit a cloth layer. However, most concealed carriers don’t carry semi-automatic rifles or chamber their guns in semi-automatic rifle rounds. This conversation is specifically geared towards 9x19mm Parabellum, .380 ACP, .40 S&W, and .45 ACP users. The 9x19mm Parabellum round is used by NATO and NATO allies because it’s light, you can fit a lot in a pistol magazine, and it has decent ballistic characteristics when you’re considering conventional infantry forces. Whereby your standard infantry soldier is usually wearing a ballistic vest designed to protect against fragmentation, 9mm FMJ has a decent profile against that type of target. When we talk about situations a concealed carrier runs into, though, it’s not a war zone. We’re not fighting conventional infantry targets. We’re fighting, usually, criminals who aren’t equipped with any degree of body armor and usually in a situation where over-penetration of target is not ideal. A hollow point round is designed to expand when it penetrates past the cloth layer and enters soft tissue. This creates an expanded wound channel. The faster your target has a drop in blood pressure, the faster he loses consciousness or the ability to continue to fight. Additionally, because a well designed hollow point round won’t over-penetrate, it requires your enemy to seek medical treatment because he may not have an exit wound. With ball ammunition, so long as you do not hit a vital organ or artery, your target can stabilize himself. If he does escape, there’s a greater chance he can evade detection by not needing advanced medical treatment. There’s a second class of defensive rounds called frangibles. Copper frangibles are bullets that come apart — or fragment — once they enter into soft tissue. This creates a bunch of debris inside the soft tissue of your opponent. He now MUST seek medical help. By forcing your opponent to seek medical help, you are both forcing him to stop engaging you and increasingly the likelihood that law enforcement will identify him at the hospital. Now, that’s not all there is for defensive round choices. There are wadcutters, semi-wadcutters, center-posts, and a number of others which all have their own unique ballistic characteristics designed to STOP THE FIGHT. Stopping the fight is always the priority — not killing your enemy. In order to do this, you need defensive rounds that are geared towards creating the types of wounds that will force him to stop and re-evaluate his situation. Full metal jacketed rounds are the usual “load out” of any gun owner when he hits the range. They’re cheap, effective, and great for improving marksmanship. Defensive rounds, on the whole, are more expensive per case. This causes a natural hesitation in the mind of a budget-conscious gun owner or concealed carrier. 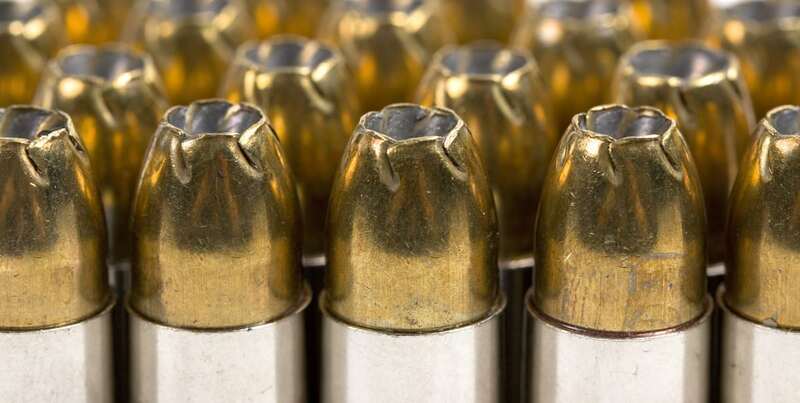 For the price of a case of FMJ ammo, a lot of concealed carriers may only be able to pick up a few boxes of their favorite defensive ammunition. Before you carry your defensive ammo in your daily carry, though, you should fire at least a few to ensure they work properly with your gun. Some defensive ammo can have a funny configuration that makes your gun more prone to jamming or failing to fire. You want to find out this information at the range, in a safe environment, before finding out in the real world. Whatever defensive round you decide on: make sure it’s not FMJ and make sure it works with your gun.